CoolSculpting is a non-surgical procedure offered for men in our NYC clinic that eliminates stubborn areas of fat without needles, knives or downtime. Candidates for CoolSculpting are those that wish to avoid the anesthesia, needles, and incisions which are are often associated with other surgical options. This medical FDA-cleared breakthrough technology was first created at Harvard University and now developed by ZELTIQ Aesthetics. After your fat freeze reduction treatment, you may resume your normal daily activities immediately. Results from CoolSculpting can be seen over a period of two to four months. On average, you’ll see a 25% reduction of fat in the treated area after only one visit. CoolSculpting uses a special device which utilizes the natural destruction of cells that occurs when exposed to cold temperatures. Freezing temperatures contract the targeted fat cells, which causes apoptosis, eliminating fat cells and freezing the fat. The body absorbs the fat through metabolic processes over a period of 3-4 months. Surrounding cells, skin, tissue, muscles, and nerves are all left unharmed. Studies have shown that up to a 25% fat reduction occurs after one treatment of CoolSculpting. Watch below how our trained CoolSculpting specialist performs this procedure from start to finish for our patient at our NYC clinic. Prior to CoolSculpting, a consultation will occur with the surgeon at our NYC clinic to determine which areas of the body should be targeted for fat reduction. The entire procedure takes 1 hour. CoolSculpting is pain free and feels much like an ice pack being placed on your body. No anesthesia or medication is needed. The cold temperature offers a pain reducing quality. Many patients multitask while the surgeon works; reading, working on their computers, talking to friends, or even napping. A gel substance is applied to the area being treated to protect the skin. Cooling panels on the device will send freezing temperatures to the underlying fat cells while suctioning the skin. The mixture of coldness and pressure may leave the skin slightly pink or reddish for some time afterwards, typically subsiding within a few minutes to a few hours. Since CoolSculpting is non-invasive, there is no downtime. 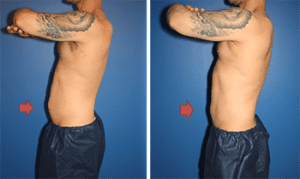 Our male NYC patients may return to work or any of their other normal routines immediately after CoolSculpting procedure. Some patients report a tender feeling in the target area, while others do not. If the area does feel sensitive, it usually goes away after 24 hours. Minor bruising may also occur, but will diminish within two weeks. Some side effects, such as numbness, tingling, and bruising are possible, but will correct themselves over the course of a few weeks. Results for male patients can take up to 3 weeks to be noticeable. After this time, patients will see a gradual, natural-looking improvement of the treated area. It can take 3 to 4 months for the apoptosis process to fully remove all treated cells. The patient and doctor may agree that additional treatments are necessary to enhance the results, although one treatment can yield satisfaction. Areas can be retreated as soon as 2 months after your treatment. Healthy eating and regular exercise will help patients to maintain their new appearance. Male patients can learn more about the non-surgical CoolSculpting treatment in NYC to help freeze fat and naturally eliminate it from your body. Please fill out the contact form or call us at (646) 480-7750.